Aquaplant's Pond Management Diagnostics Tool is a user friendly educational interface to learn about aquatic plants. It was designed by Texas A&M Cooperative Extension to help pond owners identify aquatic plants and learn about different management techniques to control them. These include mechanical, biological and chemical control options. The site contains excellent pictures of different plants by vegetation type, making plant identification relatively quick and easy. Some of the chemical control recommendations and approvals may vary between Texas and California so users should be certain to follow label instructions for California when using chemical controls. Purdue University Cooperative Extension Service's Aquatic Plant Management site includes a wealth of information to understand the different types of aquatic plants and their role in pond ecosystems. 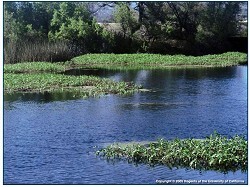 The site also provides information on how to minimize or prevent aquatic plant infestations and how they can be managed using preventive, mechanical, biological and chemical methods. 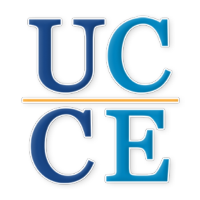 The UC Davis California Aquaculture program is a wealth of aquaculture-related information, including approximately 300 aquaculture publications on topics such as Pond Construction, Recreational Lake and Pond Management and more. The Aquaculture Network Information Center (AquaNIC) is the gateway to the world's electronic resources for aquaculture information. AquaNIC contains information on numerous topics, including Farm Ponds, and links to hundreds of online publications. CDFG's Farm Fish Pond Management in California is a very useful, comprehensive guide to constructing, stocking and managing ponds for recreational fishing and other purposes. The Western Regional Aquaculture Center (WRAC) was developed to take advantage of the best aquaculture science, educational skills, and facilities within a twelve-state area in order to provide for enhancement of viable and profitable commercial aquaculture production in the US for the benefit of producers, consumers, and the American economy. The WRCA website contains aquaculture links, news and publications. USDA's Alternative Farming Systems Information Center offers a comprehensive list of aquaculture websites, publications, employment information and government resources. California Aquaculture's Permits, Licenses. Laws and Regulations: A Guide for Aquaculture in California addresses the regulatory processes impacting aquaculture in the state. CDFG's Regulations Governing Private Stocking of Aquatic Plants and Animals summarizes the laws and regulations for stocking private ponds for non-commercial use. CDFG's Aquaculture in Inland Waters of California summarizes laws and regulations pertaining to commercial aquaculture in privately owned waters. California Aquaculture's Species Selection for Recreational Fishing in Small Ponds and Lakes addresses the selection of fish species as it relates to physical resources. California Aquaculture's Fish Stocking Strategies for Large Mouth Bass in Recreational Ponds and Lakes discusses bass stocking strategies for recreational fishing ponds in which other species of fish are used as food for the bass.